Leeds United's past five meetings with Swansea City. Leeds United welcome Swansea City to Elland Road on Wednesday night ahead of another important game in their Championship campaign. Leeds have won each of the last five fixtures between the two at Elland Road and the Whites will be wanting that form to continue in midweek over Graham Potter's Swans. So, leading up to Wednesday's fixture, we look back at the past five matches between the two sides at Elland Road ahead of this season. Leeds came from a goal down to win the last match between the sides 2-1, thanks to Luciano Becchio's third goal of the season. The Swans took the lead when Stephen Dobbie slotted past Shane Higgs after 13 minutes but Bradley Johnson's close-range effort levelled the scoring 10 minutes after the interval. 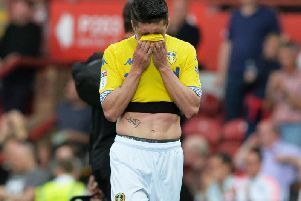 Eight minutes later, Leeds completed the comeback after Becchio pounced on a rebound from Neil Kilkenny's shot to take all three points. Two goals in just five minutes decided this contest between the two sides, as the Whites climbed out of the relegation places in League One. Jermaine Beckford scored the first goal of the afternoon on the hour mark, drilling his shot into the bottom corner before David Prutton made it two when he found the net from outside the box. The result meant Leeds secured a club record stat of seven straight league wins. Peter Lorimer scored the only goal of the game as Leeds edged past the Swans at Elland Road. The win took Leeds up to a points tally of 36 and stretched the club's unbeaten run to four matches on the day. Leeds went on to finish 10th in the 1983/84 season whilst Swansea finished 21st. For the first game in the 1981/82 season, Swansea ran out 5-1 winners but this fixture served as pay back for United as goals from Byron Stephenson and Aidan Butterworth made sure Leeds avenged the previous result. The win took lifted Leeds to 14th position in Division One in front of just under 19,000 fans. This FA Cup Third Round tie between the two sides was the start for Leeds in their 1970 FA Cup Final campaign. Goals from Johnny Giles and Mick Jones settled the tie on the day with Don Revie's Whites going on to play Sutton United, Mansfield Town, Swindon Town and Manchester United on their way to the final.